TMHT Vorago! 28th June, 8:30pm BST, 9:30 CET, 15:30 EST. The event will start at 8:30pm UK time, other timezones are shown in the countdown below. 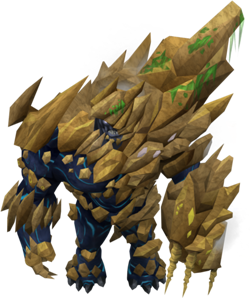 - Vorago is a gigantic, rocky and extremely powerful boss monster created by the Anima Mundi, or as he refers to it, the "earth soul", billed as the toughest boss monster in RuneScape! - The most common & widely used methods of taking down Vorago is with Magic and/ or Melee... because some of Vorago's phases require you to do a lot of damage as quickly as possible only the best weapons in the game are good enough, so level 90 Weaponry is a must, however if you are using Magic level 80 weapons can be used instead. * Please note the setups shown are just examples, Dungeoneering shields & Ports armours can be used instead. 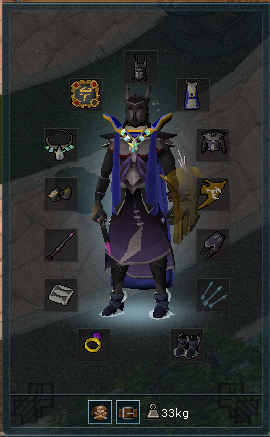 ** Also for Magic users, the Chaotic & Armadyl Battlestaff's can be used in place of Virtus Wand+Book. 90+ in Attack, Strength, Defence & Constitution if you choose to opt with melee but only 90+ Range/ Magic & defence if you don't. 95 Prayer for stat boosting prayers & soulsplit! (If you don't have access to curses, an Amulet of Zealots combined with the basic boost prayers is a suitable alternative. Below Is a brief written guide on how to do a successful Vorago kill, we recommend you take note and come clued up before battle if you haven't been before! Before entering the fight, Vorago will charge a massive attack of 50,000 damage... This will be split amongst everyone who accepts his challenge, so please be sure to have a healthy amount of lifepoints before starting. Having a shield equipped & life points boosted from a bonfire should be more than enough to survive this. Throughout the fight one thing needs to stay the same, player positioning... Vorago sends magic orbs to those stood out of melee distance, these are AoE attacks so hurt surrounding players... because of this, tanks need to stand as far back as possible, normal range & magers need to hang around in the middle, a few steps out of melee distance is enough & meleer's ofcourse need to be in melee distance however try to refrain from walking under Vorago as he does the same Stomp damage like the Corporeal Beast! Please Note; Some of Vorago's phases change each week, this is for correct for the phases seen in the Vitalis Rotation. To pass this phase one person will need to climb up the side of the arena & jump onto Vorago while another positions Vorago's back to face the jumper. Because of the preciseness needed for this phase, its advised everyone have Incite OFF & no agressive familiars be brought along. This phase is time based & requires a fair amount of teamwork, or else there will be many deaths! 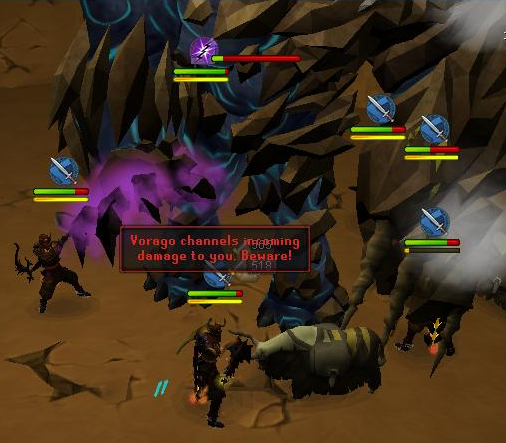 A short while after Vorago does the bleed attack 5 times he will then reflect all incoming damage to a random player, it is your job to stop attacking Vorago as soon as the message that he is channeling damage to you or someone else appears! 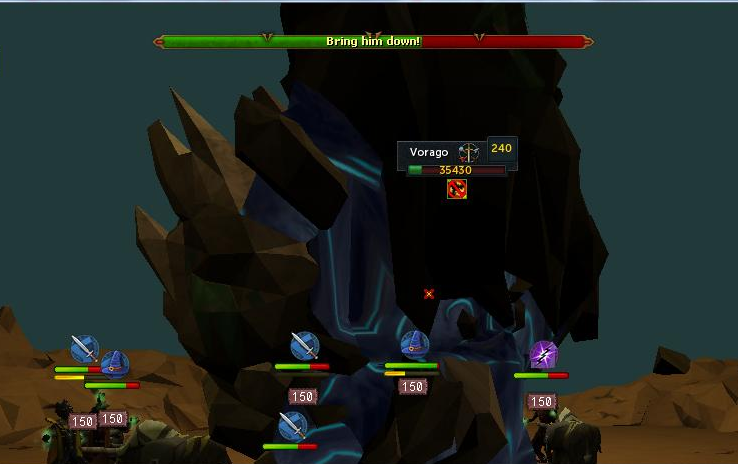 Once this process is repeated 3 times Vorago will stumble, players will need to repeatedly click on Vorago to pull him further to the ground.. Once this is done you will need to do as much DPS (Damage Per Second), as possible. 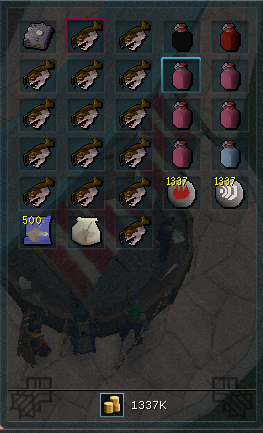 Please note the constant 150 hits you get while pulling Vorago to the ground, it is advised you keep your health above at least 3k, when this is happening. The team will need to repeat this process twice in order to pass this phase. This phase is DPS based so do as much damage as quickly as possible, player positioning is also very important in this phase. This phase is similar to Phase Two in which Vorago will do bleed & reflect damage at certain intervals, however after he reflects damage he will charge a massive fire attack... Players have 10 seconds to locate & run under the waterfall which will randomly appear in one of the 4 corners of the room. YOU NEED TO BE COMPLETELY UNDER THE WATERFALL OR ELSE YOU WILL TAKE THE DAMAGE WHICH HAS A MAX HIT OF 9500~. A few attacks after the waterfall occurs, a few people will have a Stone copy of themselves spawn, if you have one, a flashing arrow will be above it's head, everyone will deal decreased damage to Vorago for a short time also. The 5 Bleed attacks will occur soon after Vorago releases a red bomb, after the bleeds are over he will reflect damage, and then create another waterfall. The home straight! Here everyone needs to stand in one spot & simply do as much damage as possible, eventually Vorago will keep getting pushed back till he is on the edge of the platform. Vorago still makes use of reflects on this phase, so watch out! Once at the end the person with the Maul of Omens needs to use it on Vorago to deal the final finishing blow, then... Kill complete! 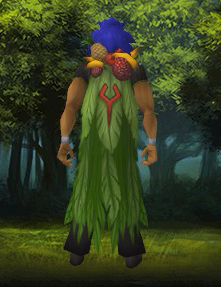 Brassica Prime and Marimbo have appeared near Lumbridge and the Cabbage Facepunch Bonanza has kicked off! Also XP-giving Guthixian butterflies spread their wings once more. Read on to find out more, or log into RuneScape right now! Spring event, free players and members. For our annual spring event, you voted for a Sixth Age battle between Marimbo and Brassica Prime. It's here - and RuneScape's never seen a contest quite like this! For two monkey-punching, cabbage-crunching weeks, the Cabbage Facepunch Bonanza is underway! Head over to the former Saradominist war camp near Lumbridge to find Marimbo and Brassica Prime facing off while Holstein of the Godless looks on - baffled and a little uncomfortable. They're holding a contest to determine who's the better god (or Godless), and their followers are competing in an underground arena in their name. To play, pledge your loyalty to Marimbo, Brassica or Holstein. Be sure to stick your speakers on, as the three are voiced by the mighty Mods Michelle, Raven and Liono! Then, enter the circular zone between the two thrones. When there are enough players, the minigame will begin. The Cabbage Facepunch Bonanza is played on a large field, with a safe zone on either side. It's played in a series of rounds, in which players have a short time to run from one side to the next while avoiding hazards. Earn points by getting from one side to the next, mining cabbage ore and punching monkeys. If a player doesn't reach a safe zone in the time limit, or is killed, they will respawn in the middle zone as a gorilla. For the remainder of the game, their objective is to kill human players running across, earning points as they do so. The game ends when all players have become gorillas, or ten crossings have been made. Reward points earned in the game can be spent on cosmetic capes, active and passive abilities to be used in the Cabbage Facepunch Bonanza itself, and several handy items that you also voted for in a recent poll. Seedicide automatically destroys seeds when they drop in combat, for double the Farming XP you'd have got from planting them; patch bombs instantly clear a farming patch for the full amount of XP and items (noted); and slayer VIP tokens give you a choice of two targets when you next start a new slayer assignment. Although the minigame and most rewards will remain after the event is over, you have just two weeks to help your faction to victory, and to claim the awe-inspiring capes. Get punching! Enjoy, and let us know what you think over on the forums. Seasonal D&D, XP rewards are members only. Last year, we let loose swarms of Guthixian butterflies as part of the Tribute to Guthix event. In memory of the slain god, the butterflies are back. If you're a member, catching a butterfly grants you a chunk of XP in your lowest-levelled skill - much like Tears of Guthix. You can gain XP for catching up to 20 butterflies each day. If you didn't before, you can collect up to 15 memories of Guthix by collecting butterflies. You'll get a memory every fifth catch, and can get up to four memories per day. If you don' t have them already, you can claim the three-piece butterfly outfit, Butterfly Dervish emote and Sword of Edicts cosmetic override from Memstix, just north of Falador. The butterflies will stay in game for two weeks - until the Cabbage Facepunch Bonanza ends. Read the patch notes for further details of today's updates. The Ninja Team have added two new sets of level 90 degradeable power gloves - the ascension grips for rangers, and the celestial handwraps for mages. These can be picked up from Order of Ascension members and celestial dragons, respectively, while on a slayer assignment for them. Solomon's got some traditional Easter emotes in stock. Head on over toSolomon's General Store now! Minor stretching on the bat wand has been fixed. Taking damage from poison no longer cancels teleport animations. The inventory model for The Measure has been resized. A small texture issue with Mah has been fixed. Tooltips are no longer cut off on the Gear interface in fixed screen mode. The range in Al Kharid's kebab shop now has a Cook at option. Zadimus' remains can now be buried correctly which allows players to once again complete the Shilo Village quest. Apep is now correctly stood behind Ozan in the scene at Draynor shore in the Stolen Hearts quest. An issue where text was being cut off in one of the chat boxes displayed during the Brink of Extinction quest has been corrected. Players no longer need a ring of visibility to get a holy cithara after completing Fate of the Gods. The price calculated by the wealth evaluator for several degradeable and tradeable items now more accurately reflects their value. The requirements for teleporting using the Mask of Gloom/Helm of Darkness has been adjusted to give better feedback about why a player cannot be teleported. The boulder blocking the entrance to the God Wars Dungeon is no longer missing its Strength and Agility requirements. Banned guests can no longer spam a clan chat with Clan Admin messages by constantly attempting to re-enter the channel. The speed of the scroll bar has been changed on the emotes interface. It is now possible to attempt to pull up a sapling from a plant pot with the chance of receiving the seed back. Players can now use marrentill on Player-Owned House incense burners if they are already lit to refresh the buff timer. Several of the Pyramid Plunder animations have been updated. The animation on the stepping stones east of Shilo Village have been updated. Players will now get a token amount of Hunter XP when dismantling traps which have been tripped by creatures. The first option on coconuts is now 'Use', making it easier for them to be noted at a Tool leprechaun. The first option on toad's legs is now 'Use', making it easier for creating potions with. The text shown when a sign of the porter depletes is now red so it stands out more. The maximum actions that can be performed by the client in one cycle has been changed from 6 to 9. Managing your bank's quicker and easier than it's ever been with today's duo of updates. Equip a favourite set of combat gear or backpack-full of skilling items in the blink of an eye with quick loadouts, and clear out the clutter with ease with our new drag and drop to destroy function. Read on for more information, or log in and give it go! Quick presets are an easy way to equip yourself with an oft-used loadout of gear, or with a backpack of essential items for a skilling run. The best way to see how it works is to give it a try. Log into the game and access your bank. From there, fill up your backpack and/or worn inventory with a setup you'd commonly use - gear up as if you were going on a Slayer task, for example, or if you were running to the anvil for some smithing. From there, you'll be able to save your current backpack, worn inventory - or both - as one of a number of presets. Then, you'll be able to reload that preset from any bank, by clicking the 'load' icon next to the preset's entry. You can even assign up to two of these as 'quick load' options, accessible right from the bank interface itself. In this way, it's easy to quickly gear up for an adventure, and your skilling will be smoother than ever. Members get five of these presets from the off, and free players two. If you find you need more, you can rent them for a limited time - or even purchase more - using either Bonds, Loyalty Points or RuneCoins directly from the interface – there’s no need to go to Solomon’s General Store. Enjoy, and if you have any questions, head on over to our FAQ. We've also added the ability to drag and drop items from your bank, should you wish to be rid of them. Note that this can only be used to destroy items - not to drop them on the ground. This makes it easy to clear you bank of whole stacks of items without filling up your inventory with noted stacks first. These two updates mean more time spent adventuring, and less time spent juggling your inventory. We hope you enjoy adventuring in a more convenient Gielinor - be sure to let us know what you think on the forums! Solomon's now stocking the magnificently nostalgic RuneScape Through the Ages emote - designed and voted for by the RuneScape community. Head on over to Solomon's General Store now to pick it up! Don't forget that you can now start earning Treasure Hunter keys through SuperSonicAds! 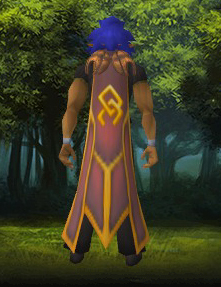 When wearing Shadow Ariane's robe top, the skin colour of male players’ torso and arms will now match the rest of their body. Some missing textures have been applied to the male Shadow Owen and Shadow Ozan hairstyles. The spit roast model in Lumbridge has been updated. Players will no longer receive scroll ports missions if they already own all scrolls in a Player-Owned Port. The Perks interface in Cops & Crooks now has horizontal and vertical scroll bars when shrunk. Azzanadra was getting a bit confused in Senntisten after Zaros' return. He has since been enlightened and feels much more informed. An issue in Zaros's dialogue that was causing confusion during Fate of the Gods has been corrected. The Fremennik achievement list will now correctly recognise when a player completes a bar crawl. Players can no longer use the off-hand bind slot within Dungeoneering to complete the "have 4 bound items" task before having the required level. A new message has been added to the clan admin message system for when a clan mate is kicked from the clan. A typo with the ban removal message in clan admin messaging has been fixed. Clan avatars will no longer disappear when teleporting from a Player-Owned House. The clan event noticeboard can now have Heist set as an activity. Players will now be able to hear a lashing sound when using the fury ability with an abyssal whip. Several examines that refer to Zamorak as evil have been made more objective. Audio drop outs on a large selection of music tracks have been fixed. Right-click options have been removed when right-clicking buttons on the ribbon. The damage from dreadnips has been slightly buffed. Korasi's sword has been made into a stabbing weapon again. All animations for crafting runes at an altar have been updated. - Will meet at Falador Lodestone, World will be announced closer to the time! At the start of the phase, Vorago will launch a small white orb away from him, it's the job of the team to run with it, standing on or around the orb when it explodes, dealing 2000 damage to every player. At least 5 players need to be standing on the orb when it explodes, or a up to 5 Vitalis will spawn, this number decreases by one for each player hit by the damage. (Note- It is possible to block the damage by using the resonance ability, but it will not heal you, just block the damage. Abilities like anticipation and debilitate reduce the damage taken by 10% and 50% respectively. This phase is simular to Phase Two in which Vorago will do bleed & reflect damage at certain intervals, however after he reflects damage he will charge a massive fire attack... Players have 10 seconds to locate & run under the waterfall which will randomly appear in one of the 4 corners of the room. A few attacks after the waterfall occours, a few people will have a Stone copy of themselves spawn, if you have one, a flashing arrow will be above it's head. Vorago will also spawn Vitalis during this phase too, much like phase 3, at least 5 people need to run to the orb to stop them spawning! The home straight! Here everyone needs to stand in one spot & simply do as much damage as possible, eventually Vorago will keep getting pushed back till he is on the edge of the platform. Vorago will occasionally spawn Vitalis during this phase, STAND STILL, if you're able to mage Vorago, then the orbs will not hurt you! Vorago still makes use of reflects on this phase, so watch out! Once at the end the person with the Maul of Omens needs to use it on Vorago to deal the final finishing blow, then, following an awesome animation... Kill complete! Power to the Players - New Poll System. The Power to the Players poll system is here! From today, the future of RuneScape is in your hands. Through frequent polls - voted on in-game through the Community interface - you'll set the course for RuneScape's content updates. You'll vote on the order of our most anticipated releases; set the tone for our holiday events; decide which monsters are in need of a drop table rework, and much more. From now on, almost everything headed for the game goes through you first. With your input into every major update we release, we'll make RuneScape the game that you want to play. Read on for more details on Power to the Players, or log in and vote now! You can access the new poll system in the game itself. Open the Community (previously Social) interface, and you'll find the polls under the 'Vote Now!' tab. Note that the quick polls displayed on the RuneScape homepage itself are not part of the Power to the Players system. We'll be adding a way to vote in the new polls to the RuneScape homepage soon. Dragonstone polls are where you'll decide the direction of the game - voting on topics that define what RuneScape is. You'll see our biggest blockbuster updates polled in the Dragonstone category - as seen in this month's Invention vs Elf City poll - as well as core mechanical changes, and other game-changing updates. There'll be just one Dragonstone poll each month, usually running for its entire duration. Diamond polls cover major updates, or changes to key game features. You'll see two Diamond polls each month, running for up to a fortnight each. Ruby polls get down to the nitty-gritty. They'll tend to be about specific aspects of upcoming updates, or content that caters to a specific group of players. You'll get three or four Ruby polls each month, each running for around a week. In this month's big poll, you'll decide which of two hotly anticipated updates we create first: the Invention skill, or the Elf City. Decide which type of enemy you'd like to be less miserly with their drops, out of beasts, demons, elementals and ghosts. Alternatively, you can say they're all fine as they are. We've got a doozy of a new minigame coming up soon, featuring instanced maps that are themed around iconic RuneScape regions. We've decided on several themes already, but here's your chance to pick one more: Ashdale, Canifis, Isafdar, the Wilderness, Zanaris, or none of these suggestions. Do you like your springtime celebrations traditional - an Easter-based theme, complete with bunnies and chocolate eggs aplenty - or would you prefer something different: an ape-vs-vegetable clash between Marimbo and Brassica Prime? Choose which type of draconic foe you'd most like to tangle with: alchemical, celestial, gemstone, gold, or none of these. Reducing the number of game worlds would make those that remain livelier, with more players around to trade, talk and adventure with. Would you like us to do this, or would you prefer to keep the number of worlds as they are? Updates agreed on in these polls are guaranteed to happen, so choose carefully. However, you can change your vote up until the poll closes (10am GMT on the stated closing date), so you'll have time to think about your decision. The first three polls are open right now, so get voting now! Be sure to visit our dedicated Power to the Players forum to give us your feedback, as well as your ideas for future polls. RuneScape's your game - help us make it the game that you want it to be! Open the Community interface and select the 'Vote Now!' tab. You must be a RuneScape member. Tonight - 5pm GMT on the 13th of January - the Community Team will be running a Q&A session on the new poll system. Head over to the Power to the Players forum from then to ask your questions. Hati and Sköll will be menacing the Fremennik Province from the 16th of January. World map icons are now divided into categories, and can be hidden or displayed as needed. Zooming into or out of the world map using the mouse wheel now focuses the zoom on the mouse pointer. Take a look at the patch notes for other updates released today. The Remove Roof setting now removes the furniture in Player-Owned Ports. The thrown-weapon model for death-touched darts has been corrected. The eye patch is now a snugger fit around the player's face. Some textures used on the Barbarian Assault walls have been fixed. The Mexican Wave and Sportsman emotes now stop when players attempt to perform another action. The royal crossbow no longer alters the shoulder position when equipped. Elf-style wigs no longer cause female characters' mouths to display incorrectly. Fixed the run animation when wielding the santa sack and water balloon. Reduced the model size of Solomon. Zilyana's Hard-Mode death animation is now much smoother. Some small graphical issues occurring during certain Birthright of the Dwarves cutscenes have been fixed. Ardrigal mixture now correctly uses the Make X interface. A misleading message regarding farming at a patch other than north of Port Sarim has been removed. Dash symbols now appear correctly in the dialogue with Ysondria at the Nexus. You will now be warned about losing Daily Challenge progress when leaving Stealing Creation. Players are now warned before leaving the Runecrafting Guild via the portal if they are on a Great Orb Project team. In the Player-Owned Ports random event Last Orders, the patrons' voice acting can no longer be heard when the option is turned off in audio settings. A small camera issue during the World Wakes quest has been corrected. The camera view during certain sections of the Kennith's Concerns quest has been corrected. The Festive Challenge display on the Challenges interface has now been removed. The Lumbridge/Draynor achievement 'Steel Yourself For Combat' now displays the correct hint. A message box from Boric in Whats Mine Is Yours that was appearing before it should has been fixed. Elder shortbows and elder shieldbows will now be accepted correctly by Princess Astrid during Throne of Miscellania. A shortcut has been added from the Wilderness to the firemaking beacon near Ice Mountain. XP missions from a Player-Owned Port no longer displays incorrect reward information. Summoning scrolls stored in re-coloured and enchanted Slayer helms now automatically trigger familiars' special moves. A section of map used in the Rise of the Six to ensure players have a means to escape when the world is collapsing has been tweaked. Throwing axes are now overridden by throwing knives and darts in the customisation interface. 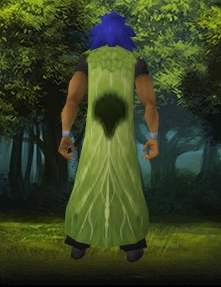 It is no longer possible to use the spam cabbage teleport to prevent PvP attacks from landing. Dragon faction tokens can now be reclaimed from the faction recruiter on free worlds. The voice acting now matches the dialogue when asking the Armadylean head warmage about the orders. The first action for rock hammers placed on an action bar is now 'Use' rather than 'Drop'. 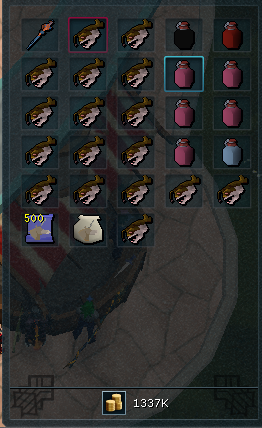 The 'Empty' option on a gem bag in a bank now works correctly. 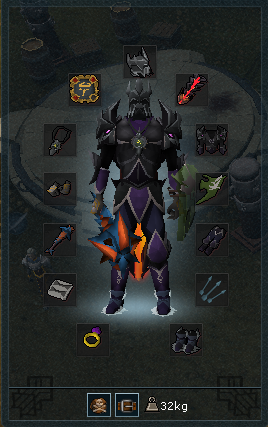 Recolouring elite Void Knight equipment while some is in a Dragon Keepsake Box now works correctly. The dragon pickaxe will now be used over the inferno adze, if you have the requirement to use it. Werewolves no longer spawn in blocked areas in Canifis. Leaving dungeoneering no longer causes the camera to move to an incorrect position. Using the grapple shortcut at Catherby no longer triggers the Friends panel to open. The memory conversion keybinds on the Divination interface now work while divining in Daemonheim. Inconsistencies with the level requirements and stats of Dagon'hai and necromancer robes have been ironed out. An issue where the text entry for gourmets would not display when entering a selling price for food has been fixed. Fixed an issue causing ambient music to not play correctly in the Monastery of Ascension. The description of Bonds on the Grand Exchange now fits correctly on the interface. An issue where the tool belt would display as null in certain situations has been fixed. The 'examine' option for tin ore in Ashdale has been corrected. Tweaked capitalisation in 'Perfect gold bar'. Temple Trekking/Burgh de Rott Ramble. The stated Attack level for Excalibur has been amended in the skill guide. Fixed a typo in the San'tar spawnling's dialogue. Players who purchase the 'Athlete' title from Solomon's General Store will now be able to activate it. Lowered the repair cost of the Virtus book to be more in-line with similar off-hand items. It is now clearer that you can exchange Tuska masks at Slayer masters for Slayer points. An issue where Fragmentation Shot would do incorrect amounts of damage in PvM situations has been fixed. Some fishy props have been added around the fishing spots in Ashdale. Some graphically stretching textures in certain sections of grass in Ashdale have been fixed. All villagers in Ashdale are now using the correct idle set of animations. The wood texture used on a crane in Ashdale has been fixed. Some erroneous shadows on the bridge approaching the church in Ashdale have been removed. The pillars inside the Ashdale church now touch the ceilings. Wood texture colours are now consistent across Ashdale. Some new ivy models have been added around Ashdale. Various tweaks have been made to the environment and bloom settings used in Ashdale. A broken texture used on a quarry ship in Ashdale has been fixed. Various tweaks have been made to animations used during the Blood Pact quest. The church altar in Ashdale no longer appears as solid white when bloom is enabled. Some errant polygons in a wall near Magda's house have been fixed. A cart in Ashdale no longer floats. Players can no longer stand inside a pillar of a bridge in Ashdale. The forge roof in Ashdale has been lowered to ensure it doesn't float. Fixed a small hole in a cliff in Ashdale. Another layer of flooring has been added to a building in Ashdale, to stop the building floating. The rusty sword has been moved closer to the player's body when sheathed. A floating fishing spot in Ashdale has been removed. Some scenery has been added, stopping players from walking behind a building in Ashdale. A rock that had a green version of a rock texture on it has been fixed. Some models have been extended to appear underwater near the docks in Ashdale to prevent the area looking like it's floating. A crate has been moved, so it doesn't appear inside a wall in Ashdale. Some variations of window and hanging flower baskets have been added to the buildings in Ashdale. The camera angle used when the camera pans to the fshing spots has been tweaked. The dock area in Ashdale has been updated, allowing players to walk among the boats. A reminder to where the quest journal interface is has been added, to be displayed if a player is currently mid-quest on the Path System. Gudrik no longer runs off out of the player's view when leaving the church area in Ashdale. Gudrik now automatically speaks to the player when they first arrive in Taverley. A chat tutorial notification is now shown when a player attempts to use the chat system for the first time. A small tutorial on how the skills interface works has been added, played after completing the Blood Pact quest while on the Path System. A reminder on how to move the camera has been added, played during the Blood Pact quest while on the Path System. The "following Khnum" section of Stolen Hearts has been tweaked, making it easier for players to follow him. The farming notification - previously played when players approached a farming patch with the Path System enabled - has been removed. Some tweaks have been made to the Stolen Hearts quest journal to better remind returning players where they are and what they're doing. The door to the Skullery building used in Stolen Hearts has been removed. The trap door in Varrock's church used during Demon Slayer has been moved, making it easier to find. A cutscene in Stolen Hearts has been changed, so it isn't necessary to click twice to begin a fight section. A world map introduction has been added during Stolen Hearts, to point the player towards the location of a Crafting store while on the Path System. A tutorial about minimap highlighting has been added to the start of Stolen Hearts, while on the Path System. A tutorial about the Reset Camera button has been added to the start of Stolen Hearts, while on the Path System.